First, Carlisle need to be commended for their excellent bacon and sausage butties; wolfed down after the team time trial up the A6. We then spoke to a few of the centre’s patients on the subject of how you go about riding a bike. We met another young guy that had had bone cancer and had been strugging with implants in his leg for about five years, but had recently had it amputated and is now looking forward to riding a bike again. Also an above knee and above elbow amputee who isn’t keen on riding roads but does trail quests and the like – going down rocky, steep descents! At each of the centres we visit there’s a representative from the Sponsor Otto Bock. 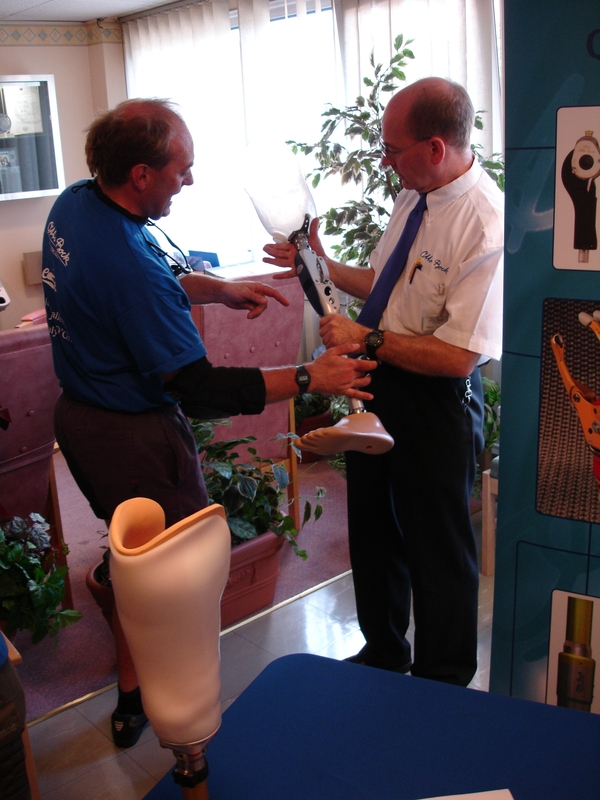 For Northern England that’s Shep Shephard, seen below discussing a new knee mechanism with above knee amputee Jim Bush. It was Otto Bock’s support at the beginning that made this event viable. Shep has a lot of experience with hip disarticulations (HDs) as well – I’ve learnt a great dealt during these limb centre visits. Richard, a Leeds lad, left us today to attend a wedding in Switzerland but will rejoin us afterwards. Dickie’s a below knee amputee who also lost all the fingers and thumb on his right hand and down to the first knuckles on his left in a climbing accident. He’s been doing very well on his new (first) bike sponsored by Gas Care in Glossop which he got a month and a half before the event. Richard starts a new job for Siemens in October. Notice we have an away strip now – Otto Bock white – although Carlisle was the last of our limb centre visits.